Great gift idea instead of flowers. For months now, I've wanted to join a CSA, so I can go to the Farmers' Markets solely for its hand-holding and crêpe opportunities, rather than for actual substinence. Unfortunately, I have spent more time analyzing CSA websites and haven't actually committed. For you Brits, CSA stands for community supported agriculture, which is one of those groups that delivers fresh, organic, local, seasonal produce to your door once a week. I've always loved the idea, but never joined in Kentucky because I had a rockin' garden as it is (different from a rock garden). Here, however, our adorable garden is one of those proper British gardens with lavender and rosemary and geranium and other things that have grown for a hundred years. We dare not dig up order for a strawberry patch. Can I suggest to anyone who wants to send flowers to a gracious host or kind neighbor that, rather than sending a bouquet, you consider sending a produce box from a local farmer? It was pretty much the best surprise. Not only do we have mass quantities of fresh fruits and veggies, but we don't have any reason to go to the grocery store this week. 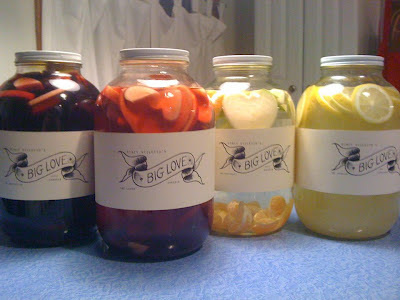 Here's what we (and by "we," I mean David) made out of our first batch. Steamed cabbage wraps with sauteed broccoli, carrots, red pepper, fennel, sprouts, garlic, and probably something else that I'm forgetting. Now, who knows something fun to do with a Jerusalem artichoke? The best and most torturous thing about living here is the proximity to all the other European cities. I know that British folks tend to think any drive over forty minutes is long haul (similar to folks in the Highlands of Louisville), but coming from a place as huge as America, it's absolute torment to be a short flight from so many cool places. The old problem of time or money comes into play here. We've got plenty of time to travel, especially when a weekend in Paris is totally feasible. We do not have the money to go to all of the places I want to see. As irresponsible as it seems to go into debt over a quick trip to Spain, it seems equally irresponsible to sit in one place while I'm so close. 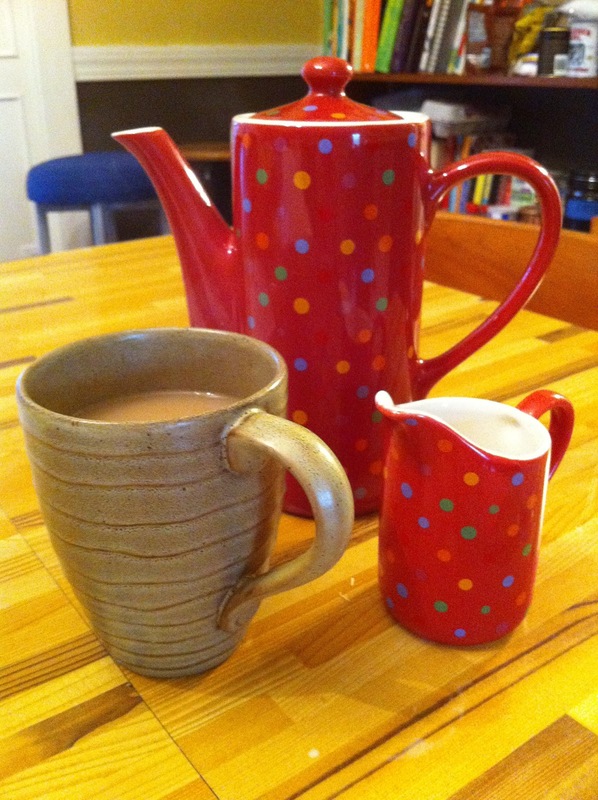 I enjoyed a cup of tea. New official feature of The Red Accordion Diaries: Linguistics! David made this for tea last week. There's a joke that pops up often over here that America and the UK are "two countries separated by a common language." There's more truth to it than fiction. While touring with an English songwriter last month, most of our spats stemmed from pure misunderstanding of language -- or one of us being offended when the other asked what something meant. I know a lot of Scots and UK English already, but several times a week, I'm puzzled by a new word. Occasionally, even when I get the word correct, I use the "Upper Class" or "Non-Upper Class" version (read: "loo" versus "toilet") to the wrong person, causing either snickers or eye-rolling. Today, I'm starting with the basics: tea. To Americans, having tea brings to mind either a straight up cup of tea or a fun little afternoon tea party with tiny sandwiches and maybe a few of your favorite stuffed animals. Folks in the UK really do have "afternoon tea" on occasion (though I do not mingle with the kind of folks who have tiny sandwiches and desserts every day), but more often when they say, "What's for tea," they are inquiring as to the night's dinner menu. And that's dinner as in "supper," or the meal you eat around 6-8pm. Oddly, I don't think supper at a British friend's home has ever actually included a cup o' tea, at least not until long after we've stuffed our faces and are digesting in epicurean delight. Funny, eh? It took David and me a while to figure out that when Catriona (our gracious host who saved us from sleeping on the streets when we first arrived) wondered what she would "cook for tea." It seemed that tiny sandwiches did not require cooking. Anyway, feel free to confound your partners or mothers by asking, "What's for tea?" Like this blog? Follow The Red Accordion Diaries on Bloglovin' for easy reading. Fun links: magazines, radio shows, and sangria. I know a lot of smart and talented people. They aren't just people who sit in their basement being creative souls; they are folks who actually do something. I don't post links or suggestions here often enough. It's time for that to change. I saw Stacy Stiletto post this on Facebook last week. She's always been a master of design, and that genius extends to cocktails, as well. Stacy also happens to be one of my favorite people in the world. If you're having a party, consider hitting her up for some of her homemade sangria. I'm currently drooling over the "Lazy Lemonade:"
Email stacystiletto@yahoo.com for details, especially if you live in Kentucky. I think it's still illegal to ship alcohol over state borders, at least in Kentucky, so I'll have to wait until David graduates to get a taste. I've been intending to tell y'all about this other website for months now, but better late... Beth Newberry and Niki King recently launched on online magazine about urban Appalachian culture. It's called The Hill Ville. It didn't take more than a couple of weeks after publication before they were receiving plenty of accolades and lecture invites. Beth and Niki are the kind of women you'd want as your boss, your teacher, and also your drinking buddy. They're also terrific writers with lots to say. Add The Hill Ville to your blog roll or Google reader, Bloglovin', or whatever you're using these days. Here's a live radio interview with Beth and Niki from WFPK's "Roots'n'Boots." Speaking of "Roots'n'Boots," you should listen to whole program sometime. When I can stay awake late enough on Sunday nights (the time change messes everything up! ), I like to stream WFPK just to listen to Michael Young's show. It's 5p-8pm ET and is always a great soundtrack for a Sunday. I feel somewhat behind in the whole Americana music scene now that I'm such a sleepyhead and can't get my weekly dose of Roots 'n' Boots. I should probably disclose that I know all the aforementioned folks really well. But then again, I met all but one of them in some sort of professional capacity (radio interviews, magazine interviews, and photo shoots) before becoming actual friends with them. There's a lot to be said for meeting people on the job. These folks are all not only great at their jobs, but great people. So who cares if we're friends? Edinburgh Cake Ladies Cupcake Bake-Off! Ever since I returned from that month-long music tour, I've had trouble dragging myself out of the house. It seems silly, especially when the only reason my shows are successful is when other people drag themselves out of their houses to come hear me. If they can do it, so should I, right? Yesterday I managed not just to leave the house, but to leave my neighborhood ... all for the sake of cupcakes. I'll do a lot for a good cupcake. Back when I lived 60 stairs up, I would make a special trip to the bakery, assuming my 60-up/60-down exercise routine balanced it out. Yesterday, however, was more than just a good cupcake. It was a charity event hosted by the Edinburgh Cake Ladies ... a cupcake BAKE-OFF!! 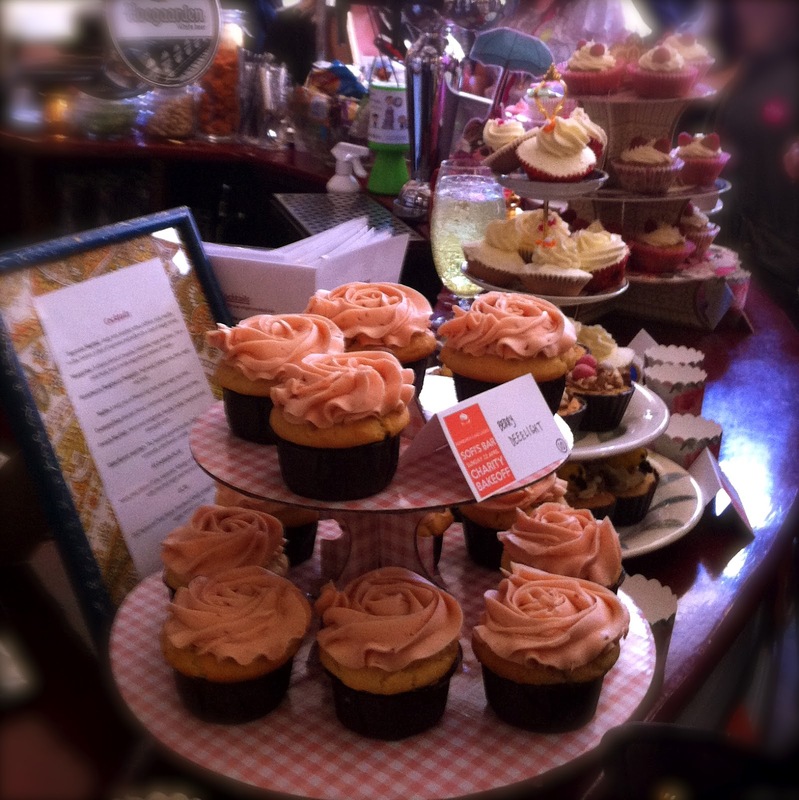 Sofi's Bar in Leith was packed solid with bakers and tasters, drooling over the 14 cupcake varities that dotted the bar. I don't think I would have had a problem eating 14 cupcakes on my own, though David and I had already agreed to at least cut them in half if we were entitled to a whole one. Seven cupcakes is a little better than fourteen, right? At least on your stomach. But because there were so many tasters, the volunteers (hats off to you!) had to cut up the cupcakes into teeny tasting bites and pass them around butler-style one at a time. It was kind of torturous, but it did prevent me a lot of indigestion. Also, I was able to sit down on the bus ride home without unbuttoning my pants (that's trousers for you UK folks), so it all worked out. We didn't stick around until the end because we had to be somewhere else, but it was a fun event. The Cake Ladies raised a lot of money for the Multiple Sclerosis Society, and I got a good sugar rush. Everyone's a winner. See what happens when you muster up the energy to drag yourself off the couch on a lazy Sunday afternoon? Oooooh, speaking of Sunday afternoons, I feel like giving away an MP3. So if you don't already have it (thank you to those who do! ), here's a freebie. And if you're in the Edinburgh area and like cake, consider joining the Cake Ladies for a future event. Details are all on their website. I try to attend when I can, but a lot of their events seem to be RSVP with limited numbers ... with my crazy music schedule, I just never know when I'll even be in town. But you planners (and I think that's most of you) would love it, and maybe I'll see you at one of them! Like this blog? Follow The Red Accordion Diaries on Bloglovin. 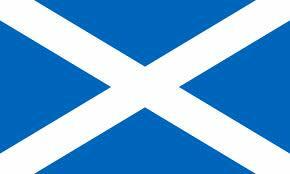 On Becoming a Scottish Nationalist or: FREEDOM!!! One major thing that happened when I was on the road touring last month: I became a raging supporter of Scottish Independence. I was pretty ambivalent before, though I always like the idea of sticking it to England (sorry, my English friends, that's just the American way!). I can't point to any one event or a particular epiphany -- I wasn't even watching Braveheart --, but when we crossed the border back into Scotland on March 19, I had one of those ridiculous patriotic moments. My high school choir (Atherton Chamber Singers) used to take huge trips to perform. 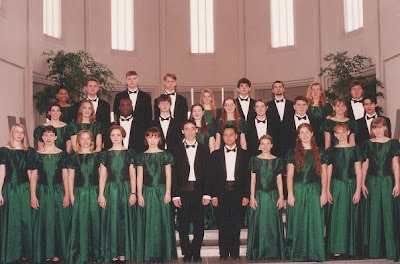 During my years at Atherton, the Chamber Singers traveled to Russia, Iceland, and New Zealand. I only went on the Iceland and NZ trips, but each time as we touched down back on US soil, the group of 24 rowdy and hormonal teenagers would burst into an eight-part a cappella version of "The Star-Spangled Banner," which brought cheers and tears from the rest of the airplane, making up for long-haul flights full of card games and loud, flirtatious behavior. I'm not exactly a USA-is-Number-One kind of girl, but I admit to feeling all Lee Greenwood during those moments. Anyway, I wanted to sing "Scotland the Brave" when we crossed the border, but I was traveling with a Redcoat and didn't want to be rude. The Scottish friends I've surveyed on the Independence issue are divided pretty equally on the question, but I'm determined to do more research and have good talking points. So who are my Nationalist friends? I want to start going to the meetings. 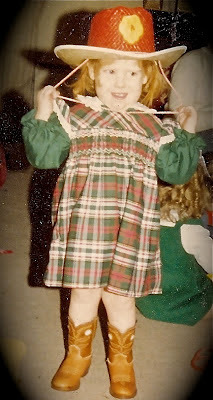 My Style: Whatever You Think'll Fit. I've been slacking on Pinterest for a couple of months now, even though I've collected several new castles to add to my Castle board. Lately, while browsing Pinterest, I've noticed that my friends are a lot more into fashion than I am. Or so it seems. This got me thinking that, yes, all but 4-5 items out of my current closet were -- take a deep breath, folks -- hand-me-downs. Yes, I'm 33-years-old, and I survive on my friends' last-season clothes. And you know what? I love it. I got a box full of used clothes in December, and it remains the greatest thing ever to come in the post (except maybe the Girl Scout cookies). You see, I can't stand shopping. I enjoy the occasional trip to the store to touch soft things or see pretty dresses or drool over the bedding at Anthropologie. When it comes to actually purchasing something, I get anxious and claustrophobic. I want out. Hand-me-downs are the absolute perfect thing because I never had to deal with a rude department store employee, an even ruder department store mirror, or actually making a decision. Plus, it's totally Green, right? Anyway, in browsing my friends' "My Style" Pinterest boards, it seems many of them have opinions on things like spring jackets, wearing mustard with mint (not food, both colors), or purses. They pay attention to things like bangles or necklaces. I'm lucky to remember to wear earrings six times a year. 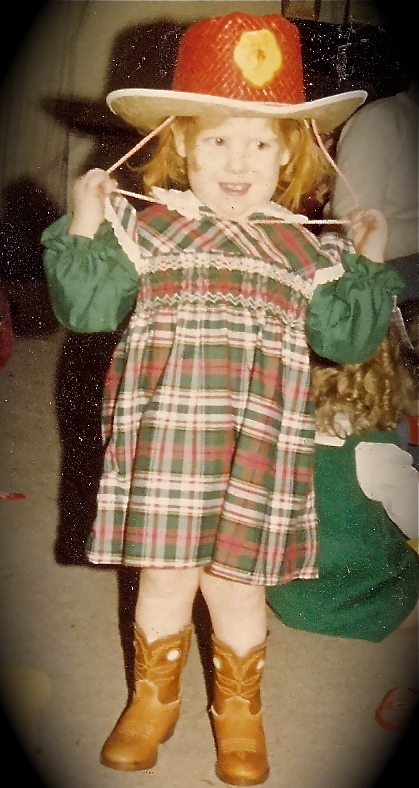 I love how everyone else looks (much more put-together than I am), but I'm pretty sure "My Style" is either: a t-shirt and jeans or, for fancier occasions, a dress and cowboy boots (which I've been wearing since before Taylor Swift was born, FYI). So I think I'll avoid a My Style Pinterest board and stick to Castles. I was going to blog about this tomorrow, but I just realized that today is your last chance to get tickets to the event. Brick and Mortar and Love, an indie-film about indie-record stores and indie-music and many other things indie, will be making the rounds in national film festivals, but you can see it in Louisville on Saturday, April 7, at 7:00 p.m. (doors at 6:30) at the Louisville Science Center (727 W. Main St). The documentary delves into the last year of earX-tacy record store and the ever-changing music industry. The film opens with Jim James of My Morning Jacket and is loaded with interviews with various other industry folk. I happen to be one of these interviewees, but haven't been able to get my screener-copy to work on my European DVD drive. Still, I remember giving all sorts of opinions about music, the biz, record stores, and such, so maybe you can go see it to tell me if I made any sense. For fun, and because Louisville is so awesome, there will be Q&A afterward with director Scott Shuffitt and ear X-tacy owner, John Timmons. Tickets will not be available at the door, so you have to buy them at Please and Thank you, 800 E. Market St (I hear you have to buy those today, Friday) or at Ticketweb.com. It's $5 a ticket, which is way cheaper than any other night out at the movies. They also have fabulous "I love local" t-shirts available. I've got one (thanks, Scott!! ), and I always get comments on it -- even in Scotland. Gas Prices, America, Europe, and Green Hippie Thinking. According to the highly-scientific surveying that is my Facebook friends, a lot of people in America are freaking out about gas being over $4.00/gallon. I'm not trying to one-up you or tell you that we have it so bad over here. I just don't think Americans know that the US is actually one of the cheapest places in the world to fill up your tank. Since I've been visiting the United Kingdom regularly (2008), gas (or "petrol" as they so eloquently call it) has hovered around $8.50/gallon. Most of Europe has been around $8/gallon for years. Think about that for a minute. To address some backlash I know I'll get, let me say I know it's not so simple as to just say, "Stop driving so much." Folks who work minimum wage jobs and have no viable public transportation means are, in many ways, screwed. I also know that oil is priced in dollars, no matter where you are in the world, so a weak dollar means other currencies can buy more (Still, it cost about $80 to fill up a Honda Jazz -- a "supermini" that holds only 10-11 gallons on my last tour.) Nonetheless, petrol has, historically, been much more expensive in Europe, and people consequently think differently about living in the suburbs or heating their homes (the ol' Jimmy Carter method -- Put on a sweater!). For the middle class -- for those of us who are seeing rising gas prices seriously affecting their monthly budgets -- it's a nice opportunity to re-think our way of life. Why do families keep buying houses farther and farther from the city or where they work? I don't know. But maybe part of it is because they can. Gas prices have been kept artificially low in the US for so long that Americans assume $4.00+/gallon is highway robbery. Honestly, this blog isn't meant to be about oil prices or taxes. I just wonder how high gas prices need to get before people start actually changing their daily lives. I'm not talking about people who already have a sense of environmental responsibility. I'm talking about people who don't feel guilty about throwing away an aluminum can or who always drive the half-mile to their grocery store. At some point, I would think rising gas prices will make people think twice about running their gas driers on a sunny day. Or washing their clothes in unnecessarily hot water. Or driving to the post office down the street. I mean, if you don't believe the environment is in danger, I'm pretty sure you still believe in your pocketbook. I don't know if it's because gas has always been high over in the UK or if they just have a bigger sense of history and the environment, but I'm really pleased by some of the little things that are common over here. Just this morning, I met a neighbor while I was hanging laundry out to dry in the garden. (I only know one person in this city who owns a drier -- and this in a country known for its rain.) Also, the Edinburgh city government even has weekly curbside compost pickup to decrease landfill waste -- a perk that still blows my mind. I've also met many friends in this city purely because I walk everywhere. A smile on the sidewalk goes a long way. Anyway, that's enough deep thoughts. I just wonder if the US had started charging a higher gas tax years and years ago, we wouldn't have lost so much green space to sprawl. Okay, I'm going to stop being a hippie now and go buy a cupcake. Though, knowing Edinburgh, the cupcake was surely made with free range eggs and other ingredients. Maybe I should rent a car and go to ASDA. On Not Being a Domestic Goddess. We are having another visitor on Saturday, which means it's time to clean the house. It's amazing how, even after instituting a no-shoes-on-in-the-house rule, the dust still rolls in. I don't remember dust being this bad in Louisville, but then our flat is a hundred years older than our Louisville home. It's had more practice at dust-collecting. It's at times like these where I start to wish we were back home an not living on a student budget. We hired a house cleaner twice last year -- once before we rented our house for Derby and once before the wedding. The cleaner came through like a tornado, even making headway with the eco-green cleaners I had around the house. By the time he left, the whole house was spotless. I can't even do that to one room with all day. I am terrible at housekeeping. Also, I have no interest in it. David's a little better (or at least he has the attention span for it), but he is equally as uninterested. You'd think with a one-bedroom apartment though, we'd be able to manage. David's dad is coming to visit on Saturday, so I guess we'd better find the broom. Come to think of it, does our new flat even have a broom? My band and a show tonight! I miss them often, but today, I really miss Peter, Steve, and Scott, aka My Band. You see, I'm playing a show in Edinburgh tonight, and I really wish it could be a full band show. In addition to P, S, & S, being three of the funniest and wisest people I know, they can show up to a gig not having seen me in months and still play everything perfectly -- even songs they've not played before. In Edinburgh I just haven't met enough folks to get a band together. I know some solid musicians who could have played with me tonight, but having been out of town for a month, I haven't had the time to get any sort of rehearsal together. I should really change that because it's getting boring playing solo. Yodel-ay-ee-oh, though. I'm still excited about playing tonight. Time to focus on positives: when playing solo, I don't have to make a set list. I won't get distracted by any amazing Steve Cooley solos, Peter's orange pants, or Scott's inappropriate-but-hilarious jokes. I guess that adds a level of professionalism that's hard to attain back home. Voodoo Rooms tonight! Show starts at 8:00. I'm on around 8:45. It's £6 at the door (or "on the door," as they say here). Adam Holmes and the Embers plays last, and he's absolutely worth staying up late for. Speaking of late, I was in bed by 9:30 last night. I'd better play some fast yodeling tonight, so I don't conk out. Those kids who aren't allowed to watch TV. I'm worried about David. Did you ever have that kid in your class whose parents thought it would be a really great idea to not own a television? Then whenever it was time to watch a video in school or if that girl came over to your house to play, all she did was stare at the screen like a zombie, complete with drool and spinning eyes until someone turned the TV off? Our new flat has a TV, and I'm now concerned about David's graduation. He was only in the flat for two days by himself before I came home for the tour. By the time we watched an episode of "Murder, She Wrote," David was singing along to the commercials. Six months without a television, followed by a flat-screen = zombie eyes. Oh, and, yes, the TV License is paid. Follow The Red Accordion Diaries on Bloglovin'. Wandering in Edinburgh: Walks on the ol' Cycle Paths. Last fall a friend in Edinburgh told me about the elusive cycle paths in Edinburgh, a series of paved walk/cycle-ways that were originally planned for a Victorian railway line. For some reason it took until this past week to explore them, but they are magical. I wandered the short mile between Warriston and Canonmills last week on my way home from a meeting and came across all kinds of treasures. The fun thing about the cycle paths (and likewise the wonderful Water of Leith Walkway) is that you see all kinds of things you'd never see from streetview. A later wander through the cycle path to Old Town revealed that the path stops right at Scotland Street. The old tunnel remains hidden and reveals itself only to the pure of heart. Or it's just been paved over. Community gardens in Edinburgh, Scotland. Cycle path in Edinburgh, Scotland. 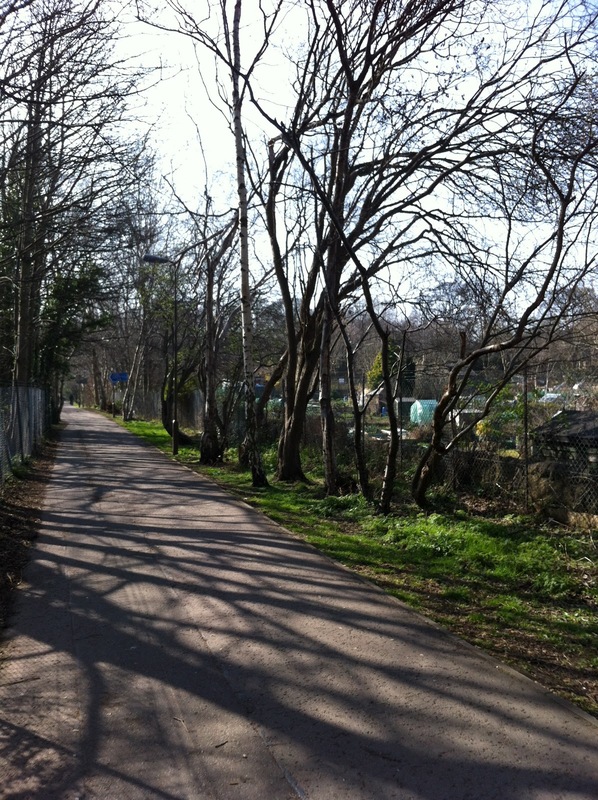 Here's a great article on the hidden cycle paths if you want to know more. And if you live here or are visiting, here's a clever map of the cycle paths, based on the London Tube maps. Have fun exploring!